In order to benefit from this lab, please get familiar with the lesson first. In order to do it click the link Back to Lesson. 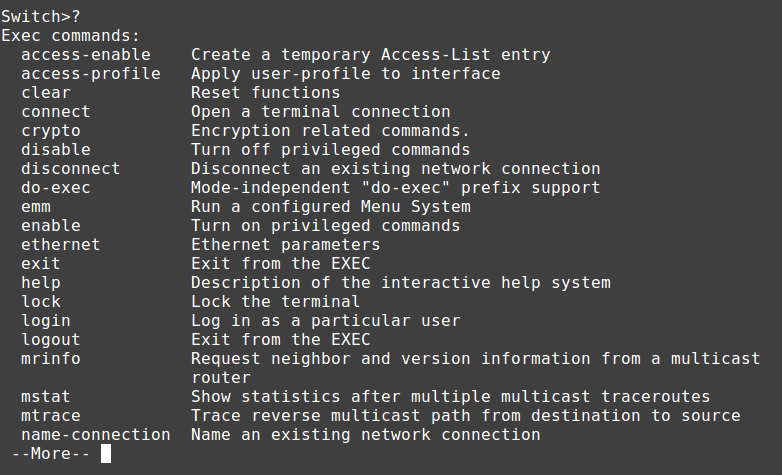 First connect your terminal software to a switch or router, power up the bad boy and hit enter. I am going to connect to my switch and let's fool around a bit with it. After the boot (a lot of messages flying out on your screen) you should have terminal access to your device. If that is the case please type no and hit enter to ignore this proposition. You should see the prompt indicating that you are in 'user exec mode'. Use User Exec Mode Context Sensitive Help. 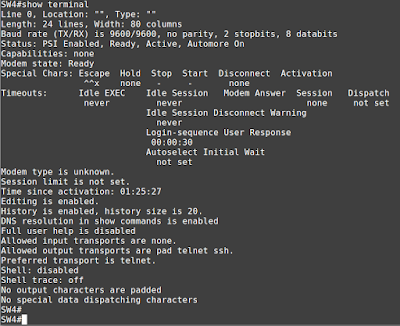 Type in question mark to see the available commands (keywords) in user exec mode. Your output might be different from mine. 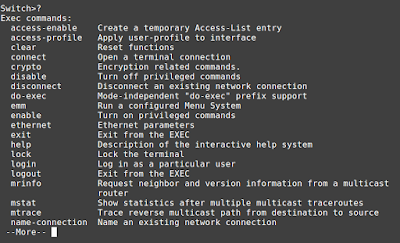 Commands in the first column on the left hand side of the screen will vary based on the type of your device (switch or router) platform (series) and version of IOS. Commands (keywords) are always listed on the left. Next to each keyword you will see a brief explanation what a particular command does. At this stage don't try to learn them all. You will get familiar with the commands as soon as you start configuring various technologies. Now, just take a quick look at the layout. Notice the -- More -- at the bottom of the page. This aptly indicates that there are more commands to be displayed but they did not fit on the screen. Press Enter, to scroll down line by line. Press space bar to scroll down page by page. If output is long, you can stop and get your prompt back using 'q' letter. Privilege level 1 is user exec mode. This mode is used for monitoring and is restricted (many commands are not accessible). Pay a close attention to the prompt. It changed from > to #. Privilege level 15 is called 'privileged mode' or 'enabled mode'. This mode allows user to access ALL show and debug commands (more on these in later lessons). This means that the user has unrestricted access to the device. It also allows the user to enter 'global config mode'. This privilege level is a synonym to administrator in Windows or root in Linux operating systems. Follow the example below. Type show privilege and accept the command by pressing Enter key. 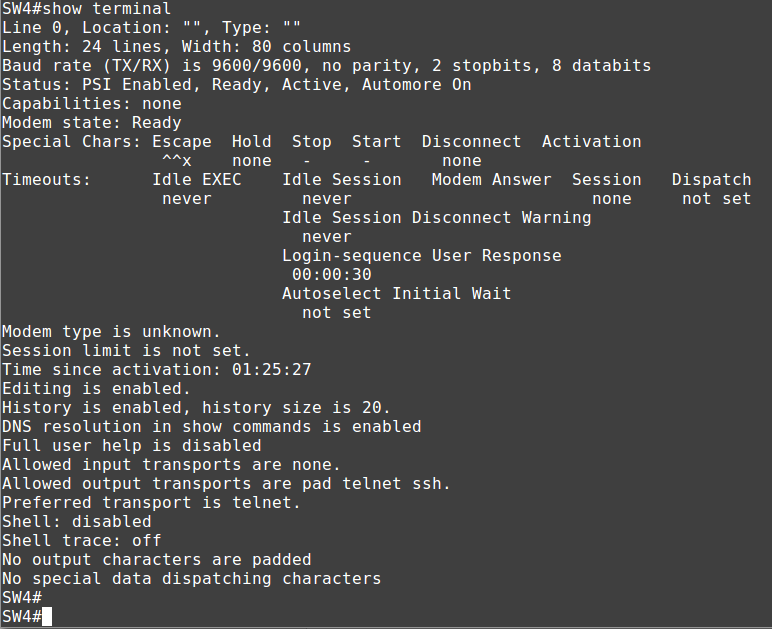 Global Configuration Mode has typically larger number of commands. In this mode we configure features that will have a global scope (will apply to the device as a whole). Notice, that the hostname shows up immediately in the prompt. As soon as you accept the command with enter key the command is being executed in RAM memory immediately. Of course, as long as syntax is correct. System does not check the logic of what you do, only syntax (there are few exceptions but that is a general rule). I will use the first interface on my device that is Ethernet0/0. You should the interface that is on your lab equipment. Notice the prompt! It shows that you are in the configuration mode of the interface you have entered. In my case it is ethernet0/0 (type: ethernet, module 0, port 0 respectively). The exit keyword takes you one step down in the hierarchy of IOS modes of operation. Your device will remember a number of recently used commands (that includes your typos). This buffer size can be changed. Notice that this time, I used a pipe sign | followed by include history. You don't have to learn them all now, but remember at least four of them (if you don't see section that is fine, not all devices have it). If you still don't know how to use them, don't worry. You will be using them with me very soon and you will learn how useful they are very soon. IOS has many features in relation to navigation like shortcuts (CTRL-a, CTRL-e, etc.). You can read about them in lesson 2. Now I would like you to practice at least four of them that I find extremely useful. Follow this step. Notice exclamation mark at the beginning of the sentence. It is like comment. If you precede something with an ! mark, hitting enter will not produce an error. It will not be executed at all. If you type in a long sentence it will not fit into the screen. Thenat the beginning of the line a dollar sign shows indicating that there is more stuff that is being truncated (invisible). Great stuff. Give yourself a break before commencing to your homework. See what I did below. Try to repeat it, but check what happened each step of the way. Two more things before we call it a day. Your configuration (hostname, interface description) is kept in the RAM memory. This means that after reboot, it will be gone. In order to save your work, you must use copy running-configuration or older command write memory. You can abbreviate them to copy run start, or wr, respectively. In order to display running configuration use show running-config or show run. In order to see the configuration you saved in NVRAM/FLASH, use show startup-configuration or show startup. I hope you enjoyed the lab and feel excited to see another one. See you soon.